Home / axa / converge / News / Converge ICT provides AXA Life fiber internet needs. Converge ICT provides AXA Life fiber internet needs. 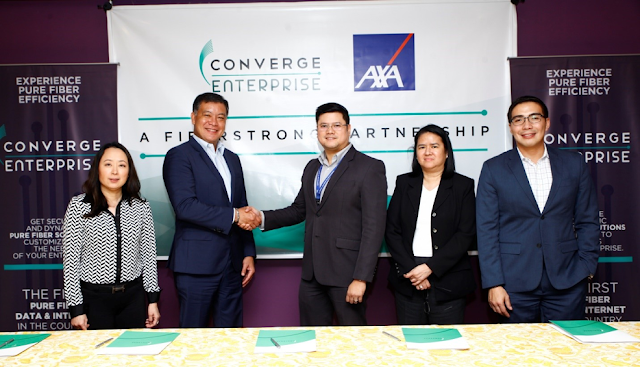 Recently Converge ICT Solutions, Inc., a leading pure end-to-end fiber optic Internet provider was engaged by AXA Life Philippines, Inc. as its prime Internet service partner. AXA Life, is one of the country’s largest and fastest-rising insurance companies, first looked at the traditional DSL-type of Internet connections. “But in this age, it’s not just about the speed and rates but also about the best customer experience. These are the most likely reasons why AXA Life chose Converge ICT.” - Grace Uy, Chief Financial Officer of Converge ICT, for her part, gave credit to Converge ICT’s modern network and affordable yet competitive rates. “Converge ICT have always provided the best customer experience. From selling to the first customer engagement, to implementation and after-sales, we always try to make the customer happy. I hope others will see this, how we can support their digital engagement, their connectivity requirements and challenges. We will constantly look at ways how to make them as flexible as possible,” Romero (Coverge ICT COO). were well rounded, had good coverage, and very stable. Of course, the fast connectivity and outstanding after sales support are well appreciated,” he commented.